Last week, I bought a 4-lb package of kosher chicken thighs at Publix. The bag cost $14.29. Ouch! That is not frugal! But with a $10 off $50 Whole Foods coupon, as well as some coupon overages, I was able to get the package for free! 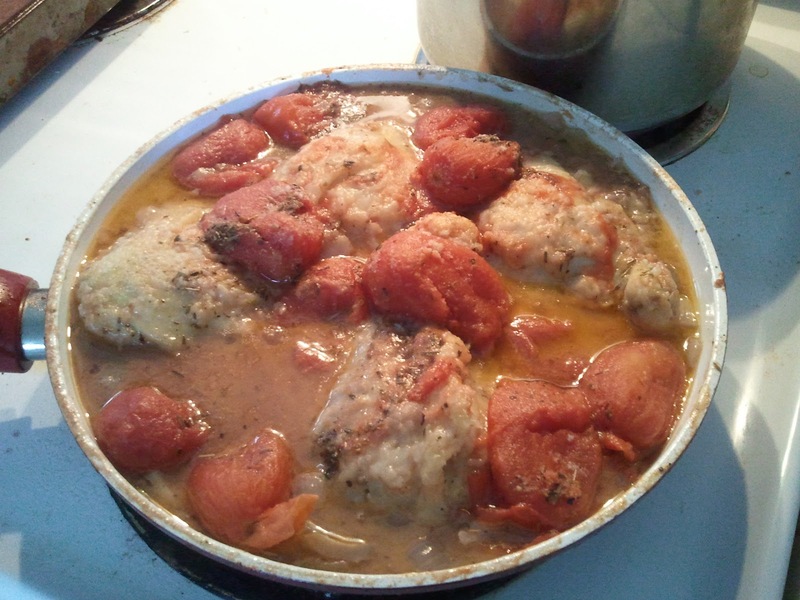 Here's what I made with them this week: Cheap Chicken Cacciatore. Remove excess fat from chicken thighs. Place flour, garlic powder, pepper, and salt in a paper bag. Place one thigh in the bag and shake until the thigh is coated with flour mixture. Repeat for the other three thighs. In a large saucepan with lid, heat the olive oil over medium heat. Add the thighs to the pan and brown thighs for about 4 minutes, then flip over and brown for another 3-4 minutes. Remove thighs from pan. Add the onion and garlic to the pan and saute for about 3 minutes or until soft. Add the mushrooms and cook 1 more minute. Add the red wine. Add the tomatoes and Italian seasoning. Turn the heat to high until the sauce is boiling. Set the heat to medium-low, add the thighs back into the pan, and cover with the pan lid. Simmer for about 45 minutes, or until meat is cooked through. Serve over shell pasta. Hi thank you for hosting! Today I’m sharing my scratch marinara #1 – roma tomato, roasted red pepper & basil. We are a cycling/running household so we eat a lot of pasta! I was tired of buying jarred marinara but dismayed when I couldn’t find a scratch recipe that didn’t contain canned tomato something, so I made my own! This is #1 of the series. Yum! This reminds me of my childhood. My mom used to make this all the time. Friday Food Fight link is up! What a steal! Way to go--and the recipe looks like a tasty and simple one. Thanks for linking to Food on Fridays! Thanks for hosting! I can't wait to read the Homemade Mayo post. I'd love to try making my own. Here from Diary of a Stay at Home Mom. I love chicken cacciatore and love to try all sorts of versions! This sound very delicious! Delicious chicken dish. thanks for sharing with Hearth and soul blog hop. Thanks for sharing your frugal recipe and linking to Tempt My Tummy Tuesday. I highlighted your recipe on the Tempt My Tummy Spotlight this weekend. Sounds delicious! Thanks for linking up to Healthy 2Day Wednesday, and come back next time to see if you were featured!